3HK, the third largest mobile operator in Hong Kong have completed 5G trials on both the 3.5 GHz and 26 GHz bands. The trials have been going on since the operator obtained temporary permits from the government of China’s “special administrative region”, for indoor and outdoor tests on the two frequencies in May and June respectively. The trial on the 26 GHz band used 400 MHz frequency resources and achieved a downlink peak speed of 3.2 Gbps, while the 3.5 GHz trial used 100 MHz resources, hitting speeds of 2 Gbps. The latter trial was on Massive MIMO technology, which enabled 3HK to claim to be the first to conduct live outdoor broadcast via a 5G network in the 3.5GHz band, although the operator hastened to add a footnote that the “first” claim was made “based on publicly-available information”. While China may not be the first country to go live with 5G – its mobile operators are more likely to by-pass the non-standalone mode and go full blown to standalone mode – Hong Kong is often among the leading markets to adopt the latest technologies, as was the case in 3G and 4G. Hong Kong is one of the most densely populated cities in the world, and the site of 3HK’s massive MIMO trial, Causeway Bay, is right in the centre of the commercial and business district. US carriers AT&T and Verizon have completed what they both claim to be the world’s first data transfer to a smartphone form factor device over mmWave 5G live networks. If we put together all the 5G ‘firsts’ claimed by the industry players it would make a long read, especially if we included cases where similar firsts have been claimed by different companies. In this most recent case, both AT&T and Verizon called themselves the world’s first to successfully transfer data over live 5G networks to purpose-built mobile devices, in Texas and Minnesota respectively. Temporally, AT&T might have stolen a step ahead of its competitor. The AT&T test took place “over the weekend”, while news coming out of Verizon on Monday declared the success happened yesterday, but they were essentially the same kind of tests. Probably the most intriguing part of the story is that both carriers used Qualcomm’s terminals on networks supplied by Ericsson. Even the technical details disclosed look very similar. Both tests were using smartphone form factor test devices from Qualcomm integrating the latter’s Snapdragon X50 5G modem and RF subsystem (see the picture), both were going through Ericsson 5G-NR capable radios connected to 3x virtual core networks. These announcements followed hot on the heels of a couple of other 5G firsts in the last few days: last week Verizon and Nokia claimed to have completed the first over-the-air data transmission on a commercial 5G NR network in Washington DC, though the receiving end was not exactly a smartphone-like device. On Monday Nokia announced its demo with Sprint to conduct the first (in the US though) 5G NR connection over Massive MIMO. We understand the marketing departments of these companies must be busy generating as big a buzz as possible in the run-up to the Mobile World Congress America (starting tomorrow). Meanwhile we cannot discount that tests and announcements (and claims) like these do show the wider world 5G potentials when the commercial networks roll out in the coming months and years, though at the moment all these firsts still do not mean anything for consumers as no 5G terminals are available yet. Another interesting angle to look at these tests is how active the US carriers are in pushing ahead 5G on mmWave, which contrast with how slow the European operators and regulators are moving. The European Commission launched a project to look into the feasibility of using mmWave for 5G deployment in the EU. A reporting session was organised in Brussels in June this year. The views were divided, and conclusions elusive. The main doubt from the industry looked to be the lack of compelling business case and the wrangling between the telecom industry and the satellite industry on the utilisation of the lower mmWave spectrum, hence the lack of contiguous bands for 5G buildout. A new set of antenna modules announced by Qualcomm promise to bring the power of millimetre wave to devices soon. The catchily-named Qualcomm QTM052 mmWave antenna module family is designed to join forces with the Snapdragon X50 modem to enable smartphones, tablets etc to live the 5G dream. Qualcomm also launched the QPM56xx sub-6 GHz RF module family to offer devices the use of a full range of 5G spectrum. 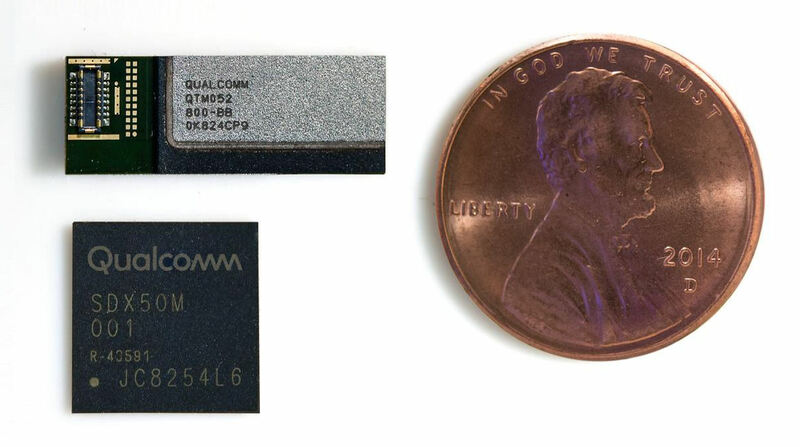 “Today’s announcement of the first commercial 5G NR mmWave antenna modules and sub-6 GHz RF modules for smartphones and other mobile devices represents a major milestone for the mobile industry,” said Qualcomm President Cristiano Amon. “Qualcomm Technologies’ early investment in 5G has allowed us to deliver to the industry a working mobile mmWave solution that was previously thought unattainable, as well as a fully-integrated sub-6 GHz RF solution. The physics of these chips seems to be where the biggest breakthroughs occurred, specifically their size and thermal properties. Making mmWave chips viable in the very tight physical environment of the smartphone is a significant challenge and chip analyst Charlie Demerjian reckons this launch puts Qualcomm very much in the 5G driving seat. For the most part, presentations at industry trade events are relatively predictable; vendors say look how amazing we are, operators say they doing as badly as you think, but Samsung actually tried something which turned out to be interesting. 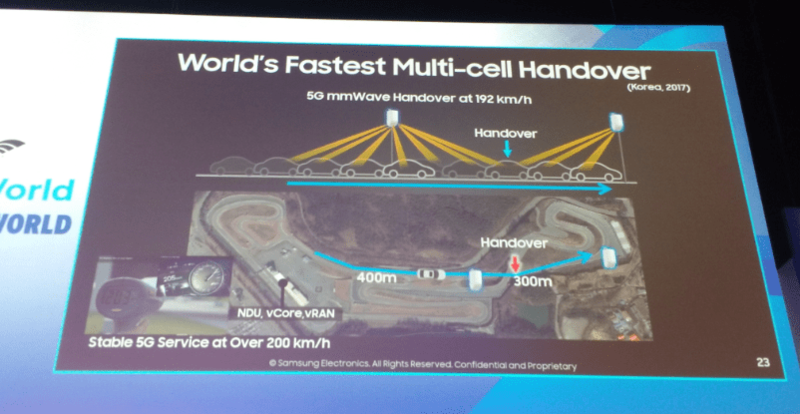 Swaggering onto the stage like a man who knew he was going to nail it, Wonil Roh, Samsung’s Head of the Technology Group, busted some mmWave myths. Roh’s presentation was certainly an interesting one, addressing many of the larger concerns surrounding the use of mmWave, not only with theoretical technological advances, but hard evidence from trials around the world to beat back the negative misers. First and foremost, coverage. Many would have you believe the distance mmWave signal can propagate is less than 50 metres, effectively writing off many of the proposed use cases. Roh’s trials in London and Korea demonstrate effective performance up to 800 metres, and even 1.2km when there is a direct line of sight. MYTH BUSTED. Staying with the line of sight argument, foliage is considered to be a major hindrance to the development of mmWave. The naysayers would have you believe mushroom shaped topiary and other garden decorations could prevent your Netflix binge session, but Roh, once again, begs to differ. Alas, this is where Roh’s good news ran out as addressing outdoor to indoor penetration is a minor win for the naysayers. “This could be an issue I have to admit,” Roh coyly stated. The Brooklyn 5G Summit describes itself as a ‘5G technology summit hosted in Brookly, NY’, which seems hard to argue with. The listed contact from the event is a Nokia email address so we’re going to assume Nokia runs the whole thing unless advised otherwise, and there don’t seem to be any other vendors involved. The big thing Nokia is looking to bring attention to this year is its Edge Cloud datacenter solution, which is inevitably being positioned as 5G-ready. Nokia has been putting a lot of effort into the datacenter side of things in recent years via its AirFrame portfolio, which looks like an increasingly wise bet as edge computing becomes ever more prominent in the telecoms world. This announcement concerns a server specifically designed for edge computing. It puts an emphasis on open architectures and software for fast deployment (it’s OPNFV compatible), and support for ultra-low latency to support things like automation and Cloud RAN. All this stuff plays a big role in 5G so that juxtaposition seems fair enough in this case. “The edge cloud will play an essential role in delivering the compute power required for 5G,” said Marc Rouanne, President of Mobile Networks at Nokia. “By expanding our AirFrame and 5G Future X portfolio we can provide a network architecture that meets the needs of any operator and their customers. And that’s not the only piece of 5G-related goodness Nokia has bestowed on the grateful residents of Brooklyn this week. Nokia Bell Labs has persuaded NTT DOCOMO to get involved in some demo some millimetre wave tech involving a phased-array chip solution for the 90 GHz band to increase radio coverage in higher frequency bands and deliver multi-gigabit speeds at scale. The main point of this demo seem to be to show the viability of 5G at these very high frequencies, including the use of a large number of antennas and also show how dynamic offloading relocation in a 5G core will enable low-latency networks. Huawei and NTT Docomo have jointly announced a field trial on the 28GHz millimeter wave (mmWave) spectrum cruising past 4.5 Gbps. Taking place in Tokyo Skytree in downtown Tokyo, the trial consisted of a base station working over 28GHz was located on Tokyo Skytree’s viewing deck at a height of 340 metre above the ground, while user equipment was placed on the roof of a shopping facility at Asakusa Station. During the test the pair achieved a 4.52 Gbps downlink throughput and a 1.55 Gbps uplink throughput with a coverage range of 1.2km. The base station supported Massive MIMO and beamforming technologies, to support long distance data transmission over the 28 GHz mmWave. As part of the trial, visitors experienced next generation video communication using a Microsoft HoloLens over the end-to-end 5G network. Huawei has said during the demonstration the voice calls were clear, and the video footage was free of any freezing. This is not the first time the pair have worked together though. Last year, another field trial was conducted in Yokohama Minato Mirai 21 District over the 4.5GHz spectrum band, where 11.29 Gbps throughput speeds and latency of less than 0.5 millisecond were achieved. Nestled in the wider Telecom Infra Project, the objective here is to make use of the much heralded millimetre wave spectrum, airwaves which have been billed as the saviour of 5G. The news will be welcomed by operators such as AT&T and Verizon, as well as urbanites who might struggle for connectivity in coming years, as data trends continue to spiral upwards. “The mmWave group will focus on advancing networking solutions that use the 60 GHz frequency band, which many governments are allocating for 5G and other high-bandwidth applications,” said Andreas Gladisch of Deutsche Telekom, and Salil Sawhney of Facebook, (the project groups co-chairs) in a blog entry. For those who want a bit of a recap. TIP is an open-source telco project, aimed at reducing the price point of operating mobile networks. It has been led from the beginning by Facebook, who might have thought it was about time to get back into the good books of the operators. There is only so long Facebook and other over-the-top content providers can use their infrastructures at no cost, without receiving passive aggressive digs. On the business side of things, Facebook does need networks to get better as well. Video has been targeted as a massive growth area for the social media giant, but if the networks aren’t there to support the experience for the user, it is hardly going to be a successful venture. Finding cost effective solutions for the operators to roll out more advanced and cost effective infrastructure is very much in the interest of Zuckerberg and co. 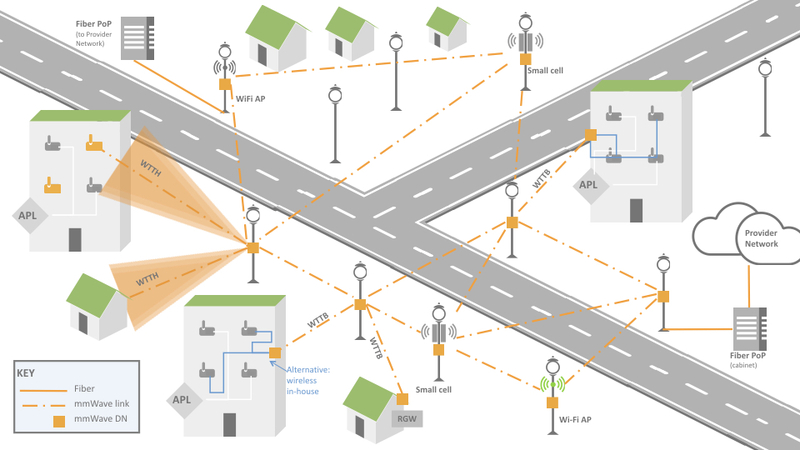 The focus of this group will primarily be the design of nodes that combine radio transmitters and receivers, which make use of a mesh configuration, with traffic hopping from node to node to reach the reception point. Think of the signal bouncing around off nodes on utility poles, street lamps and the sides of buildings, before hitting a Wi-Fi access point, small cell or a building. Using this method coverage could be provided to a pretty large area, but with a small number of nodes hooked up to the fibre infrastructure. In a perfect world, it is considerably more cost effective, much quicker to deploy and more flexible. Think about it this way, the less fibre which is going into the ground, the happier operators (and their investors) will be. Whether you’re talking about smart city applications, or mobile backhaul, there are certainly use cases for the group to target. In terms of the work points for the group, this will be split into four areas. Firstly, a cost economics model, which will help operators determine whether the strategy is one which is orientated towards cost savings or revenue generation. We would assume this decision would have been made beforehand, but validation to build a business case for sign-off is always a useful tool to have. Secondly, there will be a test and measurement module. You need to know whether the performance and capabilities of 60 GHz networking is actually worth it of course. There will also be network planning tools to help optimize the deployment of the nodes. And finally, best practise papers which range from obtaining spectrum covering permits and rules for attaching nodes to utility poles. Mobile chip maker Qualcomm has come up with a testing platform designed to enable 5G New Radio OTA trials within weeks. As with all ‘pre-5G’ announcements, this one is qualified with ‘3GPP-based’ in case you think they’ve gone mad and decided to invent their own version of 5G. This 5G NR platform operates in spectrum bands above 24 GHz, which Qualcomm is referring to as millimetre wave despite that generally accepted as 30 GHz up. This being Qualcomm the press release is littered with statements that amount to “this all just goes to show how great we are”. While it’s understood that this is the essence of most press releases, a bit of subtlety never hurt anyone. Among the generic self-promotion is the revelation that this system is designed to road-test 5G NR communication in a smartphone form-factor, dealing with challenges such as hand-blocking of the signal with technologies such as beam tracking/steering. Qualcomm has decided to share some of this awesomeness with Nokia, joining forces to try to accelerate 5G NR interoperability testing. Qualcomm did a survey recently that concluded half of consumers want a 5G phone, which it’s using as evidence that we need to get a move on. The testing will see the above Qualcomm prototype play nice with the ‘Nokia 5G FIRST solution’ to show off the full range of NR cleverness. Amon also commented on this but it was more of the same. The testing is going to kick off later this later this year and is expected to involve operators around the world next year in the build up to the big Release 15 announcement in the second half of 2018. 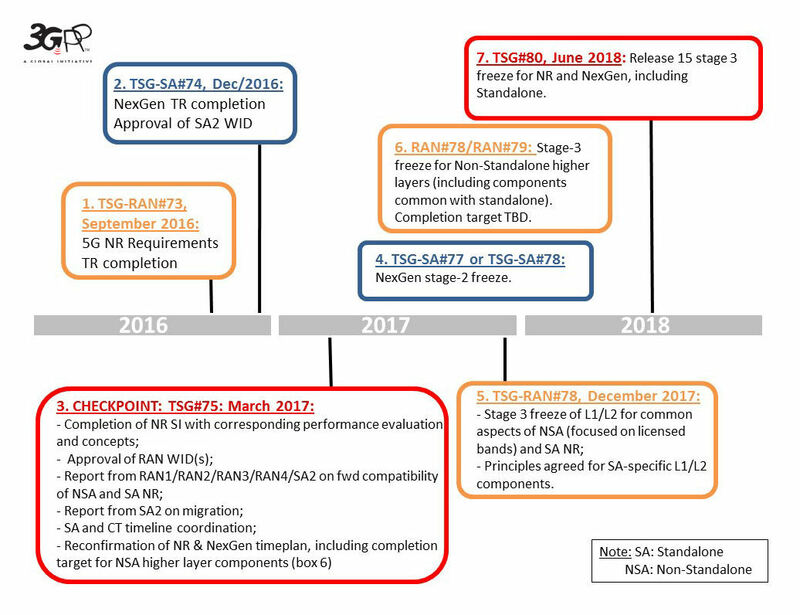 Here’s the latest 3GPP timeline that sort of clarifies things, we suppose.